On our recent visit to Something Fishy HS pointed out that it didn’t smell right. Having been brought up in the Sixties when most chippies used Beef Dripping as the frying medium, a place that doesn’t have that instantly recognisable smell will not engage us on a more visceral level. This will always be the case no matter how good the finished product and despite the fact that I actually prefer a lighter oil so that I can taste the fish. Walking past The Fryer’s Delight in Holborn, however, will take us back to a place with steamed up windows, an impossibly high counter and newspaper cones heaped high with Fish and Chips and the smell of frying mixed with non-brewed condiment. Such is the emotional resonance of olfaction. 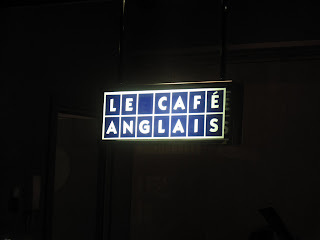 I had another such souvenir involontaire last week at Le Café Anglais in Queensway. The whiff of cloves from the bowl of Bread Sauce accompanying my Roast Grouse took me back to Sunday Dinner at our Nana’s. 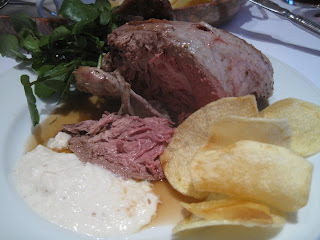 Her bread sauce was great - all thick and creamy. 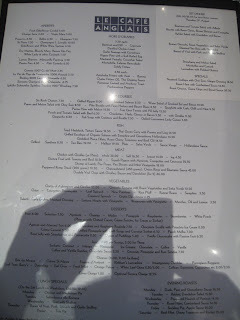 Rowley Leigh’s version was pretty good too: a bit looser, a bit more refined. Not bad – just different. The Grouse – this was the day after the Glorious Twelfth, the start of the shooting season – was predictably lovely. The young bird had a sweetness to the flesh that you lose with long hanging and yet there’s still a gamey quality that adds complexity and hints at the coming Autumn (can’t wait). I believe that if animals are going to get slaughtered on my behalf then I should at least try eat as much of them as possible. 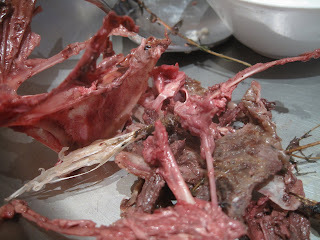 As a consequence there wasn’t a great deal of my Grouse left. The FOH said it was the best effort she’d seen so far. Bet she says that to all the patrons. With a bird as good as this there’s no need to gussy things up so all it needed were the classic accompaniments which were all present and correct. A pile of Game Chips were light and crisp and grease-free. There was the Bread Sauce of course, a small bunch of Watercress and a light gravy to keep it all moist, although the latter wasn’t really necessary as the bird was cooked perfectly. 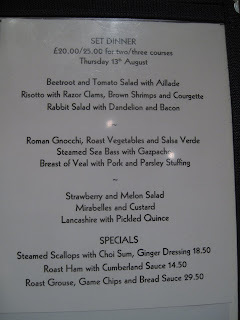 As on my first vist , almost two years ago, starters were a bit of a mixed bag. 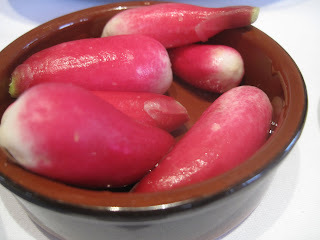 Salsify was covered in a thick batter that masked its flavour. 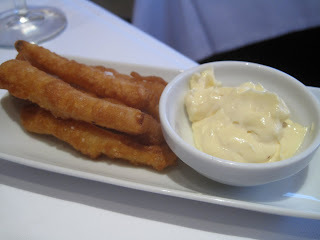 They tasted like Churros which might have been down to using the same oil that the Chips were cooked in. Not a bad thing in itself but wrong in this context. Compare with the light, oil-free version from that first visit. 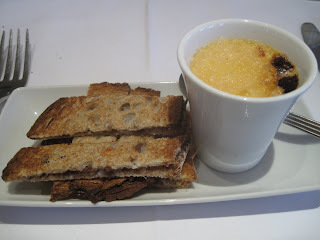 Parmesan Cream is a great Hors D’Oeuvre although the Anchovy Toasts always seem a bit, well, crude next to the pot of elegant Cheesy Cream. It’s less than a fiver though so I’m obviously just being my curmudgeonly self. 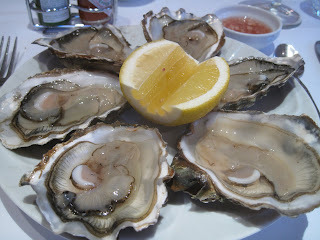 Half a dozen plump and briny Oysters were as good as you’re going to get of the Rock variety. 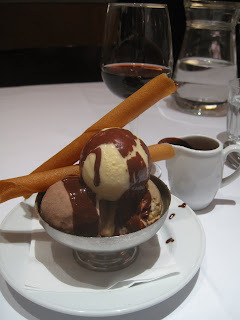 Those Fritters sans Salsify with a pot of Hot Chocolate would make a good if filling dessert but in their absence I had to settle for the excellent Ice Cream, the Coffee variety being particularly nice. I got two (count ‘em) wafers and the hot chocolate was probably unnecessary but, er, glorious. 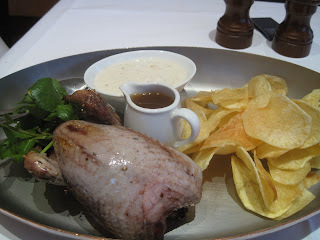 You can currently get Grouse at several several London restaurants including the venerable Rules and at the French restaurant Racine whose versions I’m sure will be impeccable. 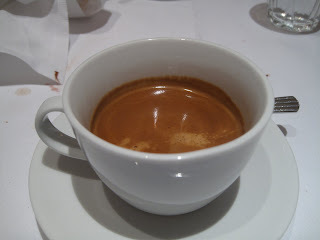 But for eating it in one of London's nicest rooms and with good service and a great atmosphere to boot it's hard to beat Le Cafe Anglais. The Bread Sauce may not be as memorable as my Nan’s but then nothing ever will be. I have been meaning to ask - can you guys recommend a fish and chip place that cooks in vegetable oil? I don't eat meat, only fish, and haven't managed to find decent fish and chips since I moved to London from NZ over two years ago. Help!